Version 2.0 is major revamp of Nagaram. Externally it has a new color scheme, new layout (especially on the iPhone X) and new word selection and hint mechanisim. 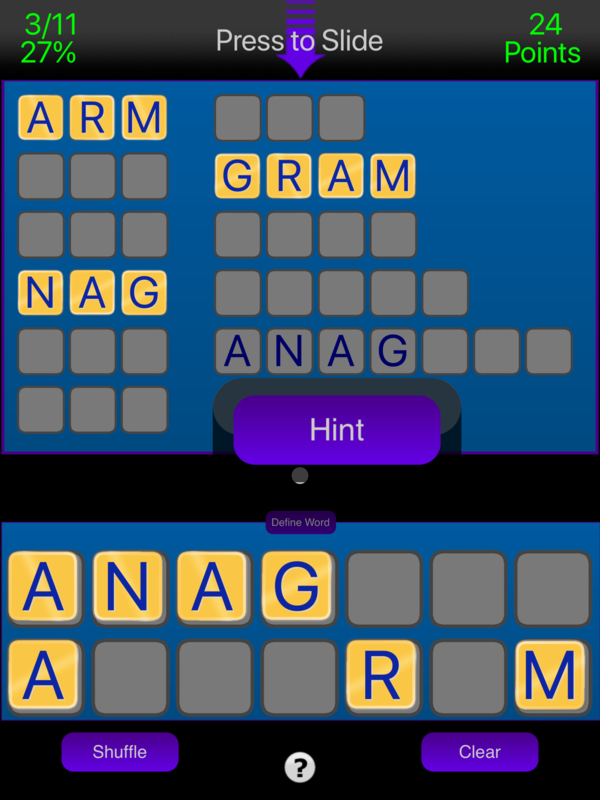 Internally a new superfast anagram solver makes building the board so much faster, that 10 letter words are now supported and rendered in moments. Choice of word difficulty. 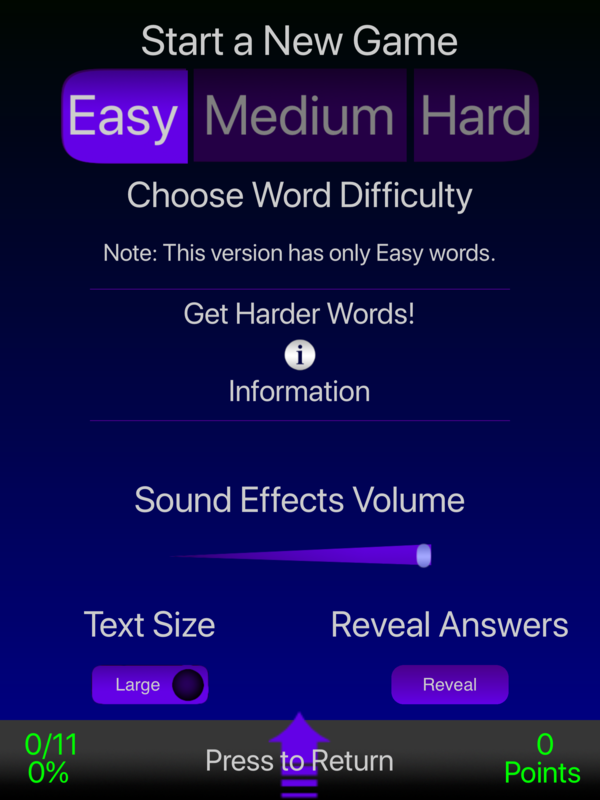 Select games made from Easy, Medium or Hard dictionaries. Easy selects words from 3 to 9 letters from a list of common English words. 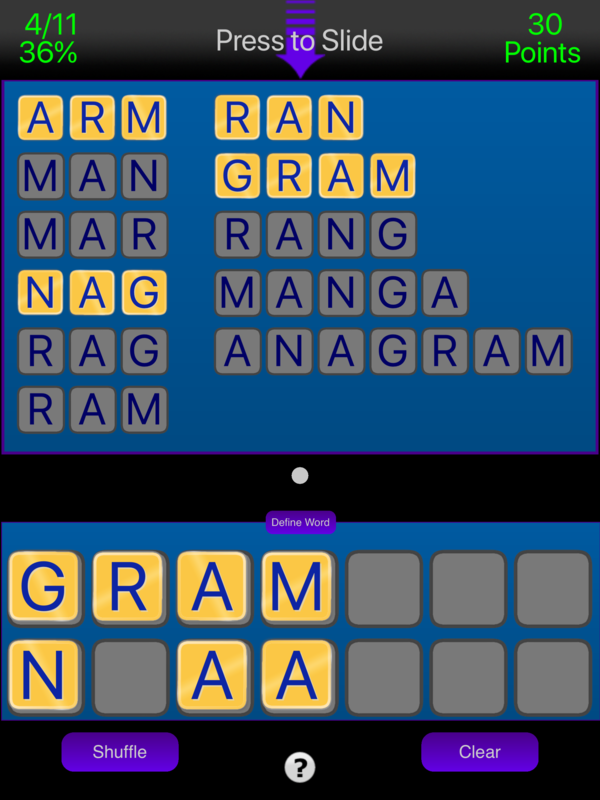 Medium selects words from 4 to 9 letters from a list that is considered to have words found in most dictionaries and word games. Hard selects 7 to 10 letter words from an insane list of almost the complete unabridged English langague. Often in Hard mode the 3 letter answers are removed so as to keep the number of answer pages managable! Hints! Can't figure out a word? Get a hint! Definitions! Look up an unfamiliar word. If the app "Terminology"" is installed, it will be used for definitions. Otherwise a select set of web destinations is used. Natural tile movement. 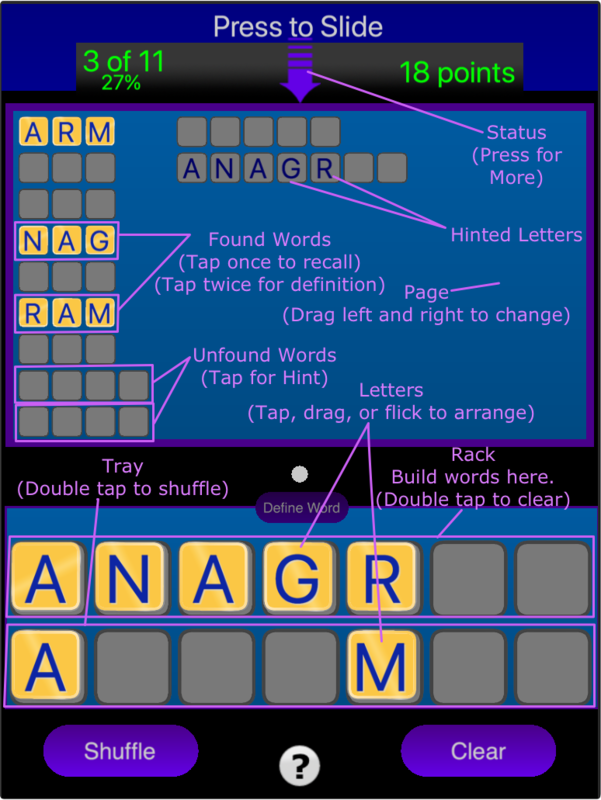 Tap, drag, flick, or slide letter tiles to the rack to make words. Very fast. Automatic word sensing. The moment the letters in the rack make a word, it is detected instantly. Family Friendly. Explicit words have been expurgated. Sound effects only (no music), with full volume control. Background audio apps continue to play. Developed with Corona Lab's Corona SDK development system. Web hosting by Google Apps. Offline word definitions via "Terminology" if installed. App Icon by Alex Spitzer. Ram graphics and animations by Alex Spitzer. Quality Testing by Eric Spitzer. Version 1.0 in honor of Eric on his birthday! Version 1.1 in honor of Charles for his valuable insight. Version 1.2 in honor of Woof! on his birthday! Version 1.3 in honor of James T. for reminding me about getting background audio to work. Version 1.4 in honor of Linda on her birthday!. Version 1.5 in memory of Elsh. Version 1.6 in honor of Rosalie. Version 1.8 in memory of Knight. Thanks to Marion B. for reminding me about updating iOS. Version 1.9 in honor of Eric's birthday. Version 2.0 in memory of Laura, Nagaram's biggest fan. Apple, iPad, iPhone, iPod touch, and iTunes are trademarks of Apple Inc., registered in the U.S. and other countries. App Store is a service mark of Apple Inc. Amazon, Amazon.com, Amazon App Store, Kindle and Kindle Fire are tradmarks of Amazon.com, Inc. Android is a trademark of Google Inc.